STOCKTON 99 SPEEDWAY, SATURDAY, JULY 17 -- Stockton’s Joey Stearns captured his first HAVOLINE Western Late Model 30-lap main event win in the DODGE Weekly Series at Stockton 99 Speedway. 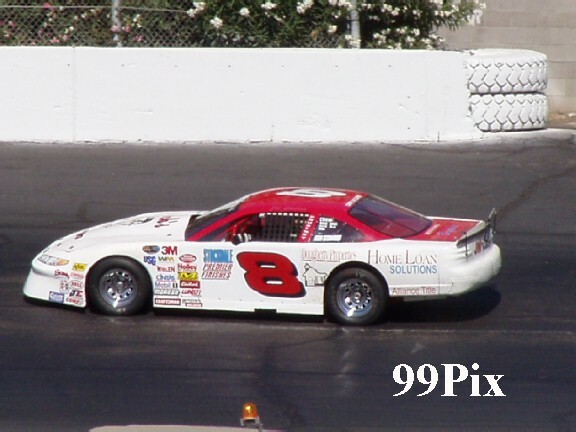 Stearns has been racing #8, on and off for 13 years, this is his rookie Western Late Model Division season. He is in the hunt for Stockton 99 Speedway’s NASCAR Rookie of the Year position, that’s why Saturday’s win was important to his team. The area’s fastest, and only, quarter-mile NASCAR oval saw no Western Late Model heats, dashes or qualifiers Saturday night, so Stearns started at the pole through luck of the draw. Stearns and Lodi’s, #57, Mike Garcia battled it out through the first three laps, when Stearns grabbed his first lead of the evening. 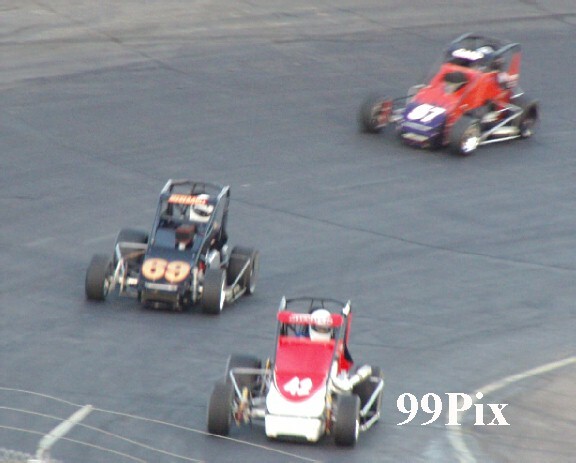 The race ran clean through lap-17, by that time it looked as if track leader Dave Byrd, #9, of Pacific Grove, was going to begin to make a challenge for first. Byrd started the race four deep on the outside, drifted as far back as seventh at one point and then maneuvered back into fourth. Then, a debris caused caution flag lined up Stearns at the pole, Manteca’s #61, Guy Guibor at the outside pole and Byrd in the outside second position. When green waved, it looked as if a new race was starting. By lap-20 Guibor had snatched the lead, then another yellow waved when Garcia caused himself and Modesto’s Harry Belletto to spinout coming out of turn-2. On the restart, Guibor was at the pole, Stearns was at outside pole and Byrd was just behind Stearns. But fans expecting to see Byrd use the restart to his advantage -- as he usually does -- were surprised when Stearns grabbed the lead in lap-21. 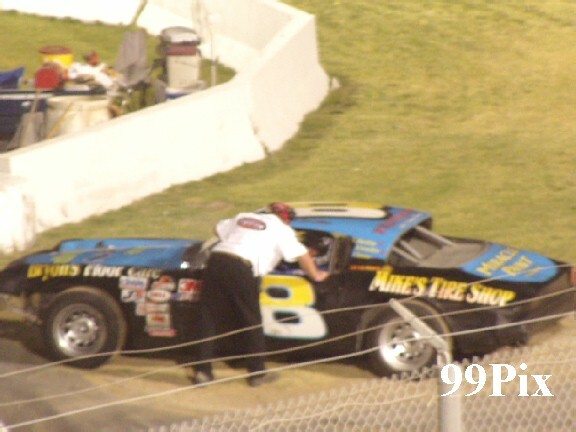 Byrd eventually drifted back to a seventh finish. 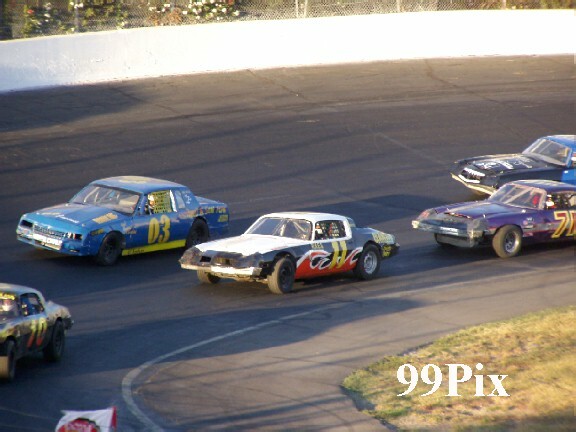 Then, Stockton’s Jerry Crawford caused another yellow when he stalled on the back stretch. At the restart Stearns jumped into first and held it through the checkered flag. Guibor finished the race in second, Turlock’s Chris Monez, #11, took third. 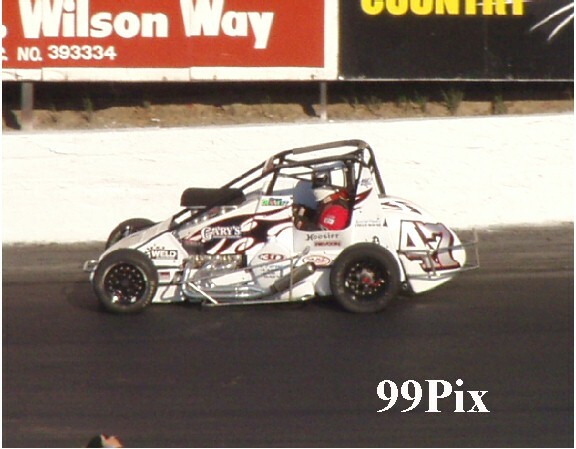 Stockton’s, #5, Pete Anderson Jr. earned fourth and Chowchilla’s Eric Humphries finished fifth. Pure Stock fans witnessed record breaking action Saturday night when Modesto’s #15, Charlie Clawson set another record in qualifying of 16.609. Clawson thought he had broken his previously held record last week, but a tech inspection revealed a few too many cubic inches under the hood, this week Clawson checked out OK and the new record now stands. 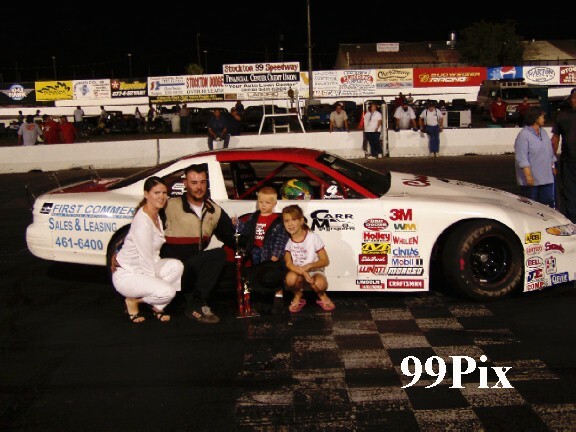 Stockton’s Kannai Scantlen, #8, captured the win in the NASCAR Pure Stock 30-lap main, his third win of the season. Scantlen started five deep on the inside. He gained the lead on lap-11 and held it through the race. 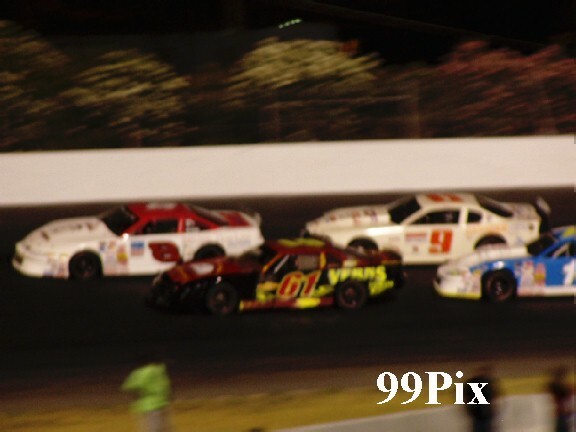 Scantlen’s maneuvering through the pack wasn’t the only exciting piece of NASCAR Pure Stock action Saturday night. Two drivers, Stockton’s Jim Vosberg and Lodi’s David Sullivan, held the lead at one point, and Clawson, who started five deep on the outside, was caught up in a back stretch spin before he eventually clawed his way to a second place finish. Jim Vosberg finished in third, Brian Vosberg ended at fourth and Stockton’s Dave Ball finished fifth. 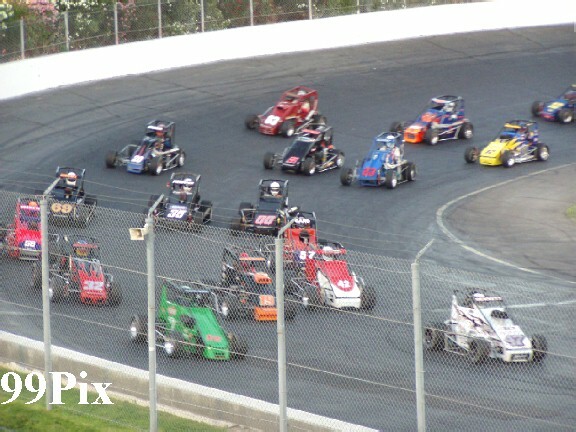 The Pro-4 Trucks, Grand American Modified and Legends took Saturday night off, and in the place of these Stockton 99 Speedway regular divisions were the Bay Cities Racing Association’s (BCRA) Midget Championships, Vintage Midget exhibition runs and USAC Ford Focus Midgets. 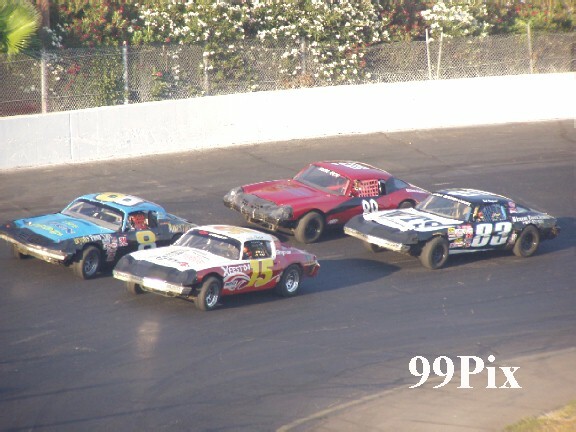 Thomas Messeraull, #69 of San Jose, won the BCRA 30-lap main, Brad Gard, #57 of Kelseyville, came in second, Garratt Boyden of Santa Cruz #32, finished third, #35 Scott Pierovich of Alamo, ended in fourth and Pete Davis of Plesanton #00, took fifth. Bradley Galadrigli, #19, took first in the USAC Ford Focus Midget race, Chase Barber finished second, Bobby McGowan finished third, Josh Lakotos ended at fourth and Bobby Michnovich took fifth. 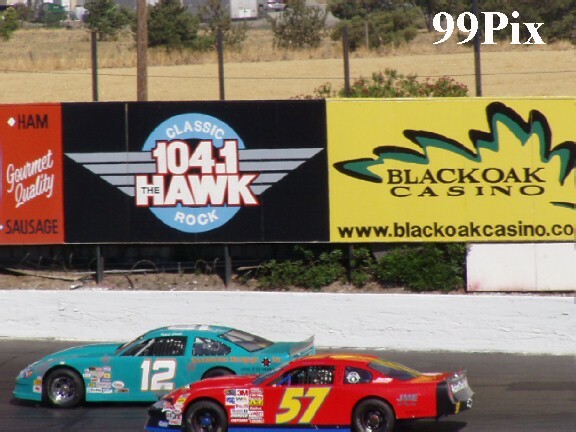 On Saturday, July 24 Dodge Weekly Series Western Late Model, Pure Stock, Pro-4 Trucks, Grand American Modified and Legends racing will return to the fastest NASCAR quarter-mile oval west of the Mississippi. Official qualifying runs start at 4:30 p.m. Dashes, heats and preliminaries start at 6 p.m. five big main events to follow. 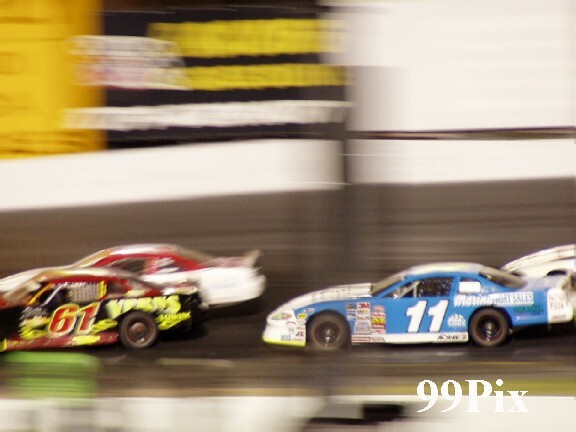 Admission to the area's only NASCAR Saturday night family entertainment is $12 for adults, children 5 and under free, juniors and seniors are $10, children 6 to 12 are $5 and family packages for two adults and up to four kids under 12 are $29.99. VISA and Master Card are always welcome. STOCKTON, CA., JULY 17: Thomas Meseraull, #69, overcame a winless season to claim victory in the Bay Cities Racing Association Midget feature at the Stockton "99" Speedway after six "near-miss" second -place finishes. 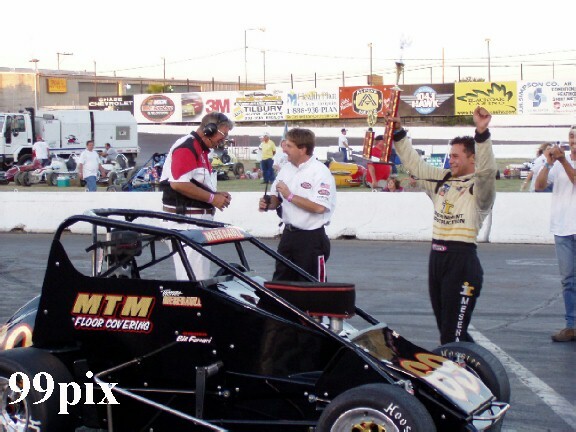 He was so thrilled with the victory that he celebrated with a 360-degree "Nextel Cup Moment" burnout spin before pulling up to the finish line to receive his laurels. As the fastest qualifier, Meseraull pulled the eight pill for the main event inversion, putting himself in the eighth starting spot in the 18-car field. Greg Dennett, #47, fresh from his win the previous weekend, started from the pole in the 3D Racing Wirth Chevy/Beast and jumped into the lead over Garratt Boyden, #42, John Sarale, #32, and Brad Gard, #57, as visiting WMRA driver Brad Curtis pitted after one lap with problems sustained from his earlier heat race accident. By the second round Meseraull pulled the Bill Ferrari Brayton Ford/Beast into fifth, then displaced Gard for fourth on the next lap. Working on Sarale, Meseraull passed the Arata/Sarale Chevy/Beast for third on the fifth circuit and set out after the leading duo. On the 11th lap Meseraull dropped to the inside of Boyden's Esslinger/Beast as they exited the fourth turn and led the lap by inches, immediately pressuring Dennett for the lead. Able to put the Ferrari machine most anywhere on the paved quarter-mile oval, Meseraull out maneuvered Dennett for the lead on the 13th lap. One lap later Boyden made his mark over Dennett to take second, then Gard moved his Borghesani Gaerte Chevy/Beast by Dennett for third on the next lap as Sarale pitted. Meseraull was in total command and left the bickering for his pursuers. Gard, challenging Boyden, took second on the 18th circuit, but immediately lost it back, then again took second with an outside pass exiting the fourth turn for his final claim on second. Pete Davis brought his Esslinger/Beast into the fray and challenged Dennett for fifth, making good his claim on the 21st round as rookie Scott Pierovich, #35, came into the picture, pressuring Dennett to take fifth on the 22nd lap aboard the former Nationals winning Tomassi Wirth Mopar/Beast that they had just purchased. Pierovich moved up one more notch with a pass of Davis on the 25th round, then battled Boyden for the remainder of the feature. Meseraull crossed the line in the rapid, under-seven-minute caution-free 30-lapper, over rookies Gard, Boyden and Pierovich, followed by Davis, Michael Hubert III, Dennett, Eric Mostin and Floyd Alvis, #18, on the leading lap with Jim Silva and Cliff Servetti finishing one lap down. Meseraull topped the field in qualifying. Tim Joyce took the first heat race over Silva and Steve Roza.The second heat garnered two red flags. 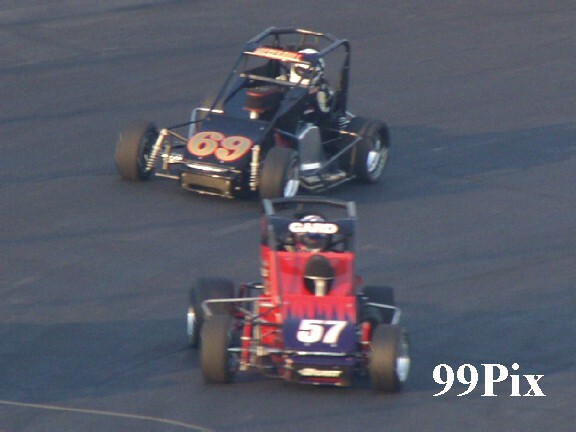 At the drop of the green the front row starting cars of Pete Davis and Greg Dennett made contact. 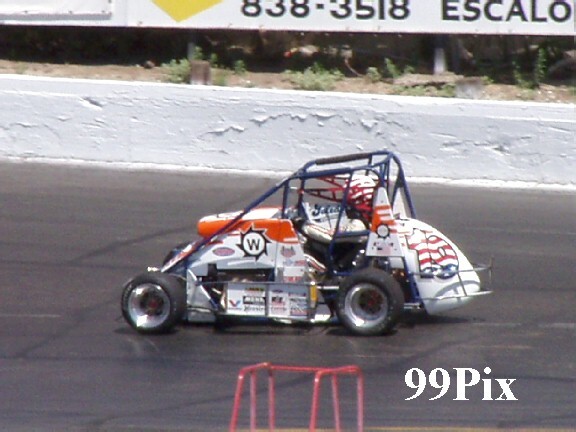 Dennett's car shot into the wall just past the starting line and overturned, skidding inverted against the concrete barrier and finally arching to a stop upright at the beginning of the first turn. Both Dennett and the 3D Racing machine were unharmed and he was allowed to restart at the rear after an inspection. 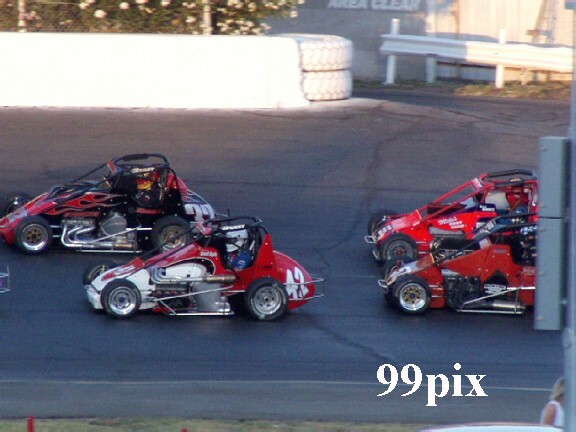 Upon the restart, the John Sarale car bounded toward the wall exiting the turn for the green. 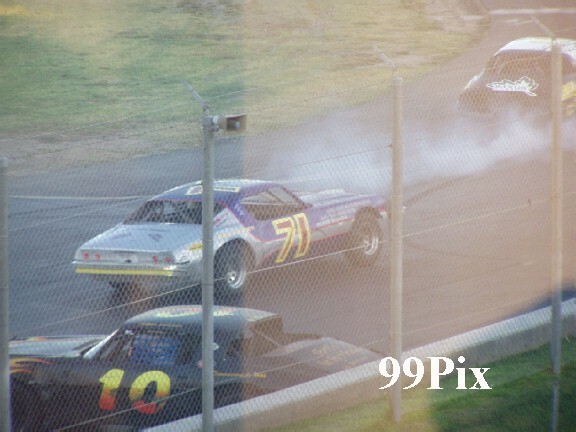 Visiting WMRA standout Brad Curtis darted to the inside, but Sarale's machine shot inward and caught Curtis' right rear wheel, sending the Wirth Mopar/Beast nose-first into the concrete wall at speed. The car inverted and, much like Dennett's ride, he rode the wall, but for more than 100-feet, before aching onto the groove of the track and snapping upright. Curtis was uninjured, but his car received notable damage. Brian Gard went on the win the heat over Boyden and Meseraull. Michael Hubert III, #56, 16-year-old rookie third generation driver, won the trophy dash. 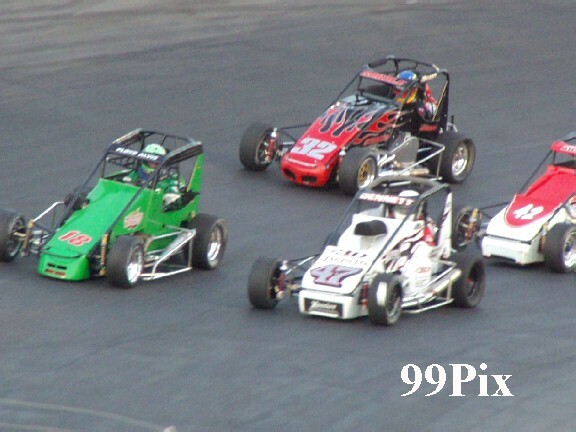 Eleven BCRA vintage division Midgets were on hand, entertaining the crowd with exhibition races. 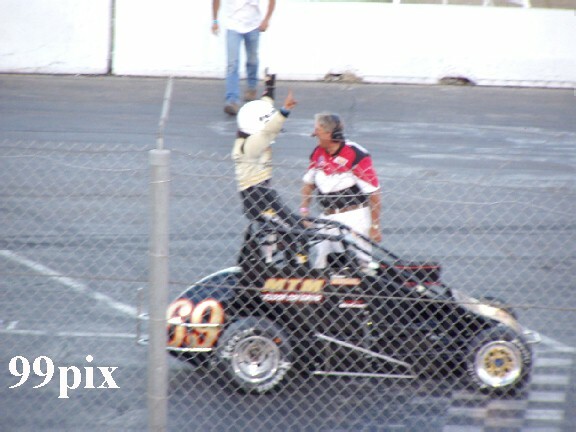 Retired 69-year-old BCRA driver Norm Rapp drove the Baia Offy to the win.